The smoothness of the driving experience has changed. Now when you sit in a new car you can’t feel anything mechanical beneath you. You glide. The machine has disappeared from the experience. What is working to get you on the road has been computerised. Except for at the other end, say, when inside a Lamborghini. That’s when you are so close to the ground you can feel every pebble of tar on the road. The reduction of dosage in sparkling wine reminds me of this: when you take away sugar from sparkling, part of the process of making sparkling wine, you lose the glide. Every crenulation of the road can be felt. Is zero dosage giving us the Lamborghini-effect for sparkling wines? Or is it more like a bumpy Model T Ford with hard metal seats? At a recent tasting of the Conegliano Valdobbiadene DOCG in London, we compared the wines, starting at zero dosage, increasing in Residual Sugar as the tasting progressed. The zero dosage wines are mostly sold in Italy (about 65% of production). The UK likes a little sugar in their Prosecco, but then, the market is two-thirds of the lower-priced Prosecco DOC (not the Prosecco Superiore DOCG). It’s a drink for a quick quaff with friends and often without food. 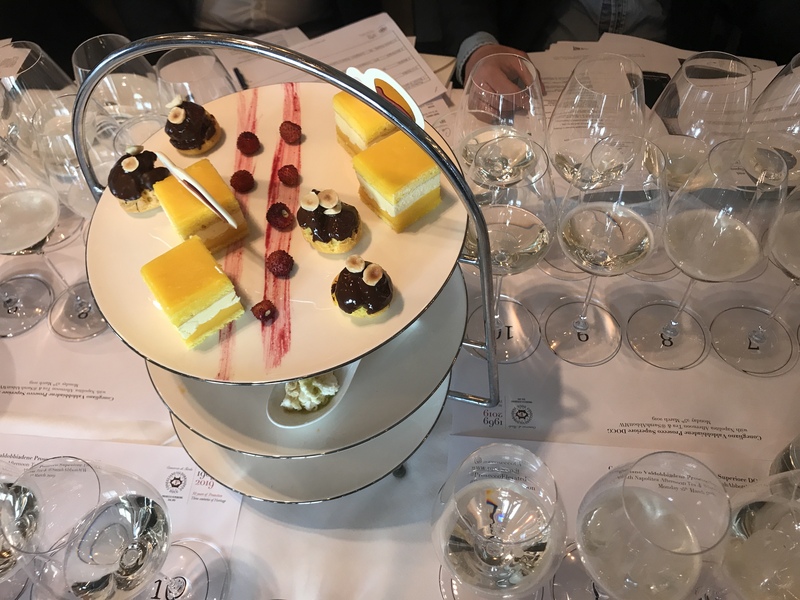 And yet, as the beautiful afternoon tea at the Hari Hotel in Mayfair showed, savoury food works well with the zero dosage styles of Prosecco Superiore DOCG. Whether this eventually appeals to the same people who like to have a casual Prosecco with friends will depend. Can the interest in “zero-sugar” Prosecco, alongside other bubble-based beverages with zero calories, turn people on to the drier style? Even if the normal, higher levels of sugar work well with cakes and sweeter treats. What I enjoyed most was the Frizzante made in a Col Fondo style. Called Malibràn, from Credamora, meaning “trouble maker” – zero dosage, cloudy and fermented more like a pet nat with its softer bubbles. This had more depth of flavour from being unfiltered, which put it into a niche group of wines. This shows the diversity happening in the region. Even though Prosecco is one of the most successful sparkling regions, and causing a noticeable dent in lower-priced, own-brand Champagne sales in the last two years, the Prosecco Superiore DOCG knows it needs to drive very fast to keep ahead of this fast-paced, bubbly game. And keep going. As regards the Dosaggio Zero/ Brut Nature / Extra Brut I send you a clarification. Our rules of production at the moment say: D.O.C.G. (controlled and guaranteed designation of origin) «Conegliano Valdobbiadene -Prosecco» wines made in the Spumante version may be marketed in all the styles allowed by the laws currently in force, with the exclusion of the «extra-brut» and «dolce» («sweet») versions. This means that at the moment producers are not allowed to produce Extra Brut but they are allowed to produce all the other typologies, that are mainly Extra Dry, Brut and Dry. In the last years, the wineries have introduced also wines of the typologies Brut Nature and Dosaggio Zero (that actually are synonym in the sense that they represent the same level of sugar, between 0 and 3 g/l). When the new rules of production will be officially approved the producers will be allowed to produce Conegliano Valdobbiadene Prosecco Superiore in the Extra Brut typology. Consorzio of Conegliano Valdobbiadene Prosecco Superiore DOCG #SuperioreAfternoon launched for the press at The Hari Hotel, Mayfair on Monday 25th March, including 42 producers of Conegliano Valdobbiadene Prosecco Superiore DOCG hosted by Sarah Abbott MW.